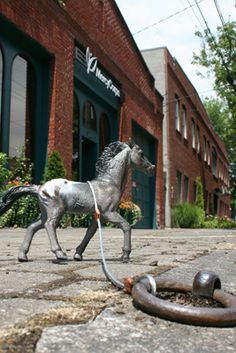 As part of an initiative to enable inhabitants to see the bizarre beauty of Portland, the community has the Portland Horse Project which sees tiny toy horses secured to rings that were once used to secure real horses in the 1900s around the city. There are said to be an excess of 200 of these miniature horses around Portland, with the occasional dragon or giraffe tied to the rings as well. That would be Portland, Oregon, I suppose? Those of us who live in Portland, Maine, tend to get snitty about the assumption that there is only one Portland of any importance! Yes, it'd be as well to be specific - link.